Most of the time, commercial businesses have only one location, especially if they are a small company. When it comes to commercial security, strict access control is essential. Most of the time, commercial businesses have only one location, especially if they are a small company. But even small companies can grow and establish multiple offices in the same city or other cities nearby, probably in the same state or in the next state over. But how can you secure these locations? By following these tips. When it comes to commercial security, strict access control is essential. Whether you rely on card readers, intercom systems or biometric scanners, all three of these methods can provide more stringent security measures for your business. You’ll have to think about how many people will need access. For instance, most of your employees might be based at your home office in Baltimore, but what if they need to travel to a location in Washington DC or Ocean City? Once you have answered that question, you have another decision to make. How much security do you need? Retail stores need protection, but maybe not as much as a government contractor handling sensitive data. One last idea for improving access control is to create and review visitor logs to see who is visiting your buildings. Growing your business means you’ll be away from the office for hours or even several days in a row. Fortunately, this is a security problem that you can overcome with remote monitoring technology. 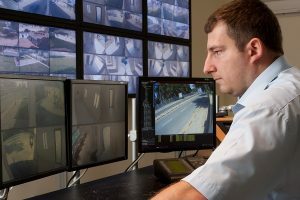 With remote monitoring technology, you can interact with your commercial security system no matter where you are. You’ll only need a smartphone, a tablet, or a laptop computer – desktop machines also work. You can turn burglar alarms on and off; unlock the door for employees, customers, and clients; and receive alerts when something happens that needs an immediate response. Securing your business doesn’t mean much if you can’t keep all of your locations safe. Thus, to get the most out of your new commercial security technology, you must ensure that every location has the same devices. The security cameras you use should all be the same model, even if they are situated in different areas. After all, if you have four locations in four different cities, it is unlikely that every building will be identical. The easiest way to make sure your premises are as safe is possible is to partner with an experienced security contractor you can trust, such as ARK Systems! This entry was posted on Friday, August 17th, 2018 at 11:08 am. Both comments and pings are currently closed.